Okay, maybe his stuff hasn't aged well, maybe he's been imitated too often, maybe he became a parody of himself, his later work overshadowing the former excellence. Whatever the case, Jimmy Cannon's reputation has faded. We rightly praise Red Smith and W.C. Heinz and John Lardner but not Cannon. That's a shame because at his best, he was not only a terrific big city sports columnist, but one of the best we've ever had. When Jimmy Cannon was a newspaper shaver, the late Damon Runyon gave him some advice: "The best way to make a living is to be a sportswriter." Cannon followed the advice, and Runyon liked the results so well that before he died he made Cannon "the custodian of my reputation when I'm gone." At 43, as sport columnist for the New York Post, sad-eyed Jimmy Cannon has also come closer than any other sportswriter to taking Runyon's place. His favorite columnar character is Two Head Charlie, a thoughtful horse player, who talks like this: "You take a real ugly bum . . . with a face a monkey would be ashamed of. Let him get a shave and a haircut and meet a broad. What's the first thing the broad says to him, she says you look cute tonight . . . I admit I look like a kangaroo . . . But every broad I take out tells me I'm cute. Soon as a dame says that, I know I can't trust her." Delicatessen Nobility. Bums, bettors, Broadway guys, hangers-on and contestants at every sports arena are material for Cannon's column; his ear is finely tuned to their talk. "They're a kind of delicatessen nobility," says he. "I know lots of guys who talk like Two Head." Cannon knows them because he was born & raised in their midst, on Manhattan's lower West Side, still lives in a hotel midway between Broadway and Madison Square Garden. At 17, as a copy boy on the Daily News, Cannon's skill with words caught the city editor's notice. Once, when a crank invaded the city room and introduced himself as "God," Cannon answered: "Pleased to meetcha. Heard a lot aboutcha." 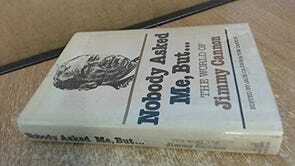 There is a decent collection of Cannon's work called "Nobody Asked Me, But..." that you can find on the cheap. After the war Cannon's sportswriting career flourished. He was given a column in the New York Post; in 1959 he moved over to the Journal-American and became nationally syndicated. Now his punchy, breezy, streets-of-New York prose could be read by sports fans from coast to coast; more important, it could be read by sportswriters, who latched onto the Cannon style as if it had been handed down from Heaven. That style was compounded of several elements. Cannon learned a lot from his two idols, Ernest Hemingway and Damon Runyon. He had a strong streak of beery Irish sentimentality, no doubt refined by the wee-hours boozing for which he was famous until a stomach operation permanently disbarred him in the 1940s. He also had a remarkably sharp ear and eye, and an instinct for cutting to the quick of a character or situation. The columns in this collection are fairly representative, which is to say that the good ones are tough and penetrating while the bad ones are maudlin and manipulative. The book seems to have been compiled as a valedictory; it contains a number of columns in which Cannon summarized his views of one sports celebrity or another, and too few of the workaday, covering-the-game columns at which he so often excelled. "The fight manager wouldn't fight to defend his mother. He has never participated in a crime of violence but he lives by the code of the underworld. He imitates mob guys in his dress, speech and manners. He accuses all inefficient pugs of being yellow; he has been a coward in all the important matters of his life. He is cranky and profane when he talks to the kids he manages but he is servile when addressing the gangster whom he considers his benefactor. He has cheated many people but he describes himself as a legitimate guy at every opportunity." Cannon could say a lot in a few words. On Satchel Paige meeting the press: "It is the small talk of a witty man used to killing time with other men on buses or trains.... He understands how to keep a good day going because he has been cheated out of a lot of them." On Babe Ruth at his Yankee Stadium farewell: "The tan on his face seemed unnatural because he didn't look like a man who had been out in the sun." On Floyd Patterson: " Patterson is an urban hermit who seeks solitude in isolated gyms, like an energetic monk practicing vows of silence and loneliness." I can only hope that Cannon's writing is collected again. He deserves a fat, snazzy compilation.